“NASA’s acknowledgement that SNC has completed this critical milestone and its approval of full production of the first Dream Chaser spacecraft is a major indication we are on the right path toward increasing vital science return for the industry,” John Curry, CRS-2 program director at the company, said in a statement announcing the milestone. While many elements of Dream Chaser were already in production, this review confirmed the overall design was ready for full-scale assembly and testing. 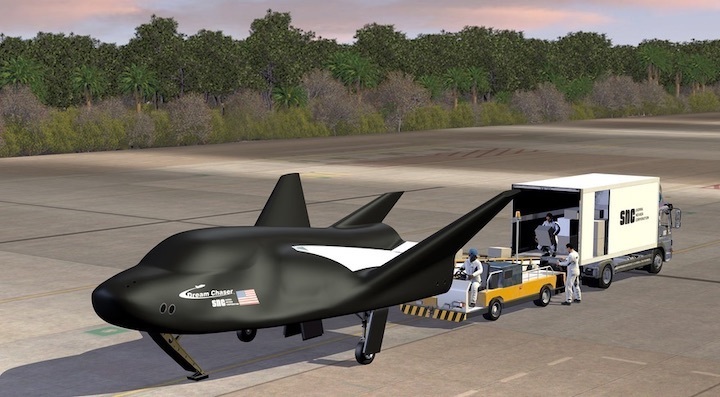 SNC, though, is keeping its launch options open for future Dream Chaser missions. “We’re looking at all launch vehicles out there,” Steve Lindsey, vice president for space exploration systems at the company, said during a panel discussion Oct. 11 at the International Symposium for Personal and Commercial Spaceflight in Las Cruces, New Mexico. Competition in the launch market has helped drive down costs for SNC. “When those launch vehicle prices come down — which, by the way, is about 80 percent of our costs on every mission we fly — that opens up the commercial market,” he said. That includes other applications of Dream Chaser, such as a free-flying experiment platform. At that conference, Lindsey said he expected to be “the majority of the way through” assembly and testing of the first Dream Chaser by next October, while planning “changes and upgrades” for a second vehicle.